It's time for another episode of 205 Live on the WWE Network! Enzo Amore has two potential #1 contenders for his Cruiserweight Championship - Cedric Alexander and 'Zo Train member Drew Gulak. They will face off one-on-one on Monday Night Raw next week. Enzo, however, has his mind on something (or someone) else, so he doesn't seem to be sweatin' it. What could we expect tonight? Hit F5 or refresh for the latest updates while the show is in progress! The show is underway with clips from Monday Night Raw last night where Cedric Alexander won a second chance fatal 4-way match to become Drew Gulak's new opponent to determine the #1 contender for the Cruiserweight Championship. Tonight, Kalisto takes on Jack Gallagher with Brian Kendrick luring in the background. First, Drew Gulak comes out to the ring with Ariya Daivari, who has taped ribs and will have the first match of the night. Gulak: "Hello, my name is Drew Gulak and since day one it has been my dream to cultivate a better 205 Live. This Monday, I face Cedric Alexander for a chance to face Enzo Amore for the Cruiserweight Championship. Cedric Alexander may have won his second chance last night, but I assure you his luck will run out. Cedric, the Grinch, stole Daivari's second chance. This man's bank account is bigger than anything else, and he willl pound Cedric into the dirt. Please stop your chanting! I'd like to announce that Noam Dar has suffered a tragic knee injury, and unfortunately he will be undergoing surgery. I will start his rehabilitation program, and I do so with myyyyyyyyyyyyyyyy... POWERPOINT PRESENTATION!! So please, turn your attention to the TitanTron for slide number - oh come on!" Alexander's music cuts him off, of course. They lock up, Daivari backs him into the ropes, clean break, shoves him, jabbers at him, they lock up again, Daivari takes an arm, wringer, Alexander counters out and trips him up. Gulak yells at the crowd through his bullhorn to stop chanting. Alexander backflips into a headscissors, dropkicks him, covers for 2, Gulak yells again, Alexander puts him in an armbar, and the crowd does dueling chants of "Let's go Cedric" and "PowerPoint!" Daivari fights back, Alexander chops him on the chest, Daivari tosses him onto the apron, and Alexander jumps over him as Daivari ducks out the ring. Gulak distracts Alexander telling him to stay off the top rope, and Daivari throws him into the turnbuckles. Daivari goes on offense, chokes him with his knee, chops him on the chest then tosses him out the ring. Gulak blasts Alexander with a lariat on the floor behind the referee's back as he was distracted in the ring. Daivari throws Cedric back into the ring, covers for 2, then puts him in a chinlock. Cedric gets to his feet, but before he can make a comeback Daivari delivers a running bulldog, gets a 2-count then puts him back in the rear chinlock. Alexander battles out, counters with a jawbreaker, hits a back elbow, kicks him in the knee, running kick to the head from the apron, HIGH springboard clothesline connects and gets a 2-count. Daivari blocks the Lumbar Check, Alexander punches him, Daivari counters the Lumbar Check with a snapmare, Alexander catches his leg and hits a hard back elbow. Daivari catches him, delivers a spinebuster, gets on the apron, Gulak shouts at him to not get on the top rope, Daivari says he got this, goes up top, connects with the frog splash and gets a near-fall! Alexander ducks the hammerlock lariat, hits the Neuralizer handspring kick, hits the Lumbar Check and gets the 3-count! WINNER: CEDRIC ALEXANDER. Gulak sneers at Alexander after the match and helps Daivari to the back. We get a commercial for NXT making its broadcast debut on the USA Network during WWE Week at 7 PM ET/6 CT.
As for Gulak, last night on Raw, Enzo Amore started to yell at him about his PowerPoint Presentations, but he stopped to talk to Nia Jax. She tells Gulak that she likes his Presentation and Enzo agreed with her. Backstage now, Gulak was talking to Daivari about going on the top rope. Enzo shows up and yells at Gulak for taking it upon himself for giving pointers and gets on Daivari's case about getting the job done. Gulak contemplates about becoming the new champion, but comes back down to reality and that sets Enzo off. Tony Nese is in the background while they go at it, but finally steps in and tells Enzo that he doesn't need to talk to Gulak like that. Enzo gets on his case and tells them all that he is the leader of The 'Zo Train and calls them all ungrateful. He calms down and says, "You need to look in the mirror, recognize your faults, and I need to step back and be the best leader of The 'Zo Train. The best way is to lead by example, so I need you all out there at ringside for my match, against Tony." Gentlemen Jack Gallagher and The Brian Kendrick head to the ring and we get clips from a couple of weeks ago when they beat down Kalisto. Kendrick: "Over one year ago, my Cruiserweight Chapionship was taken from me. Every day for the last 19 years, my dream was becoming champion. Over the past year, I haven't received one chance to become champion again. What happens when Kalisto joins 205 Live? He gets opportunity after opportunity after opportunity! What does he do? He squanders them." Gallagher: "We told you to stay away. Stay in the locker room, so you will find yourself springboarding into a spider's nest." They lock up, Gallagher with a side headlock, takedown, Kalisto gets back up, Gallagher with an arm wringer, takes him down, 1-count, tries to get his shoulders down, Kalisto is on defense, 2-count, pops up with a monkey flip, kips up and does a headscissors. Kalisto hits a forearm from the apron, gets on the top rope, corkscrew armdrag and Gallagher rolls out the ring. Kalsito does a fake dive flipping over the ropes, kicks Gallagher, does a running kick to hit Kendrick as Gallagher ducked, goes after Gallagher, but Gallagher catches his leg and smacks it against the ringpot. The referee starts his count, Kalisto barely hops back in at the count of 9, Gallagher goes on offense right away, leglock stop, tells the ref to ask him if he quits, and goes back to work on the leg. Kalisto tries to fight back, Gallagher with a knee, puts him in the tree of woe, twists his leg, pulls it down wishbone-style, then covers for 2. Kalisto kicks him away, Gallagher sprawls to the leg, dragon screw, twists his leg by his foot, and Kendrick is all smiles at ringside. Kalisto finally kicks him away again, but Gallagher kicks him in the leg, mocks his Lucha chant, and maintains control of the match as he saunters around the ring. Jack wraps his leg around the middle rope, Kalisto clubs him on the back and elbows him in the head to try and stop him, Gallagher kicks the rope, drags him by the foot then puts him in the stretch muffler! Kalisto pulls himself up and counters with a sunset flip into the Listo Kick. He side-steps him sending him out the ring, his leg is caught, so he rolls through and sends Gallagher into the turnbuckles, then connects with a springboard moonsault for 2! Kalsito connects with the basement hurricanrana, crawls to make the cover and gets a near-fall. Gallagher sticks a thumb in his eye, hits the hard hardbutt, but then Kalisto delivers a hurricanrana and pins him 1-2-3! WINNER: KALISTO. Kendrick hits Kalistio with a chop block right after the match. GRAN METALIK MAKES THE SAVE!! Metalik does a shoulder block and head kick from the apron, hits both with a springboard dropkick, and Kalisto finishes Gallagher off with Solida Del Sol! Backstage, Gulak approaches Enzo in the halls, tells him they can talk this out and asks him to call off the match. Enzo tells him there's nothing to worry about, Gulak asks him why does he have to fight Tony Nese, and Enzo tells him they it's not going to be a fight. Then he ridiculously compares himself to Dean Malenko, but says that he's just going to show Nese some holds as the best cruiserwight. "It's going to be a learning experience for everybody." Commercial for Tribute to the Troops this Thursday on USA at 8 PM ET, then a promo for HIDEO ITAMI joining 205 Live NEXT WEEK. One thing to note, Nese didn't even show off his abs during his entrance looking as if he doesn't want to do this match. The champion comes out next with Drew Gulak and Ariya Daivari in tow. Enzo: "My name is Enzo Amore, and I am a Certified G, and a bonafied stud, and you can't teach that! Bada-boom, realest champ in the room, how you doin'?! The 'Zo Train is doing incredibly well. The first ever 205 Live tour is going on the road. The main event? The realest champ in the room, people. An unbreakable unit, we're The 'Zo Train. With that being said, anyone who thinks otherwise, there's only one word to describe you, and I am gonna spell it out for you: S-A-W-F-T, SAWFT!" Enzo takes his time taking off all of his jewelry, then asks if we wanna see him wrestle. He shows off his fancy footwork, shows off his shoes, and challenges Nese to come at him. "You wanna talk behind my back? You can't, you know why? You can't get in first place." Enzo SLAPS Nese! "What are you thinking? Look at me, I'm the damn champion! I'm the best in the world and you know that. You need an Uber to the top, and I am at the top of The 'Zo Train! You feeling strong Tony? You think twice about this. You spent enough time on The 'Zo Train to be smarter than that." Nese gets fired up, starts approaching him, and Enzo starts backing up. Daivari blasts Nese from behind! 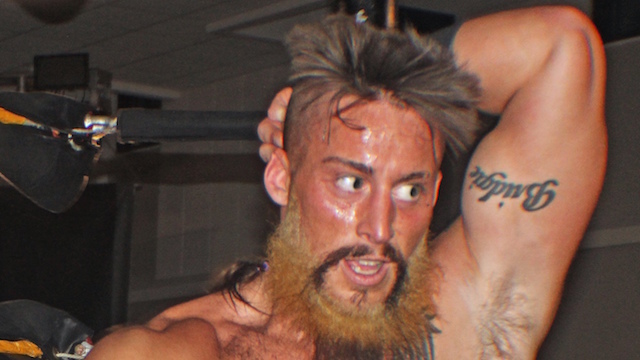 WINNER by DQ: TONY NESE. Enzo and Daivari start stomping a mudhole in Nese in a corner. Gulak is STUNNED watching at ringside. Enzo continues blabbing on, Daivari holds him up, and Enzo tells Nese that he is the best Cruiserweight Champion in the world. Enzo gets ready to hit the Jawdunzo, but looks at Gulak and tells him to get in the ring and prove he is on The 'Zo Train. Gulak reluctantly gets on the apron, Enzo tells him to use his head and get with it, while Gulak tells him it's not right. Enzo tells him to do something as he contemplates what he should do, all the while Daivari holds Nese open for attack. Gulak and Enzo have a staredown, they get nose-to-nose, and Gulak kicks Nese in the head visibly showing grief on his face. Enzo tells him to make sure he is alright, so Gulak starts beating up Nese with punches and stomps. The crowd chants "This is boring" while they beat him down. Daivari picks Nese up, Enzo says he will be alright, says he will show him mercy, but then hits the Jawdunzo while holding his Cruiserweight Championship. Nese is laid out while Enzo, Daivari and a remorseful Gulak stand over him.